Bloomberg tracks the fortunes of some 2,800 billionaires. Of those, 145 are worth at least US$10 billion, making them decabillionaires. Now, the world contains two centibillionaires simultaneously. Microsoft Corp. co-founder Bill Gates, once the world’s richest person, has again eclipsed the US$100 billion threshold, joining Amazon.com Inc.’s Jeff Bezos in the exclusive club, according to the Bloomberg Billionaires Index. Gates’s fortune, now US$100 billion on the nose, hasn’t reached such heights since the dot-com boom, when Bezos was only beginning his march up the world’s wealth rankings. 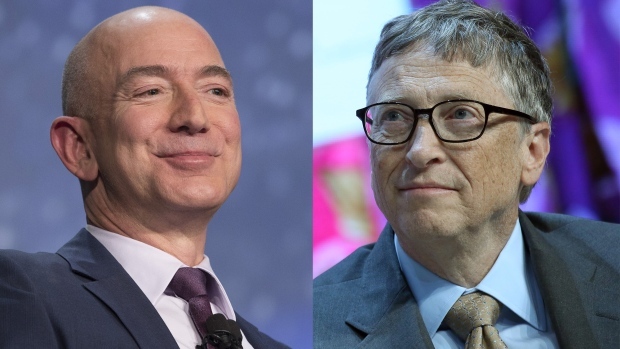 The Amazon founder is now worth US$145.6 billion, having added US$20.7 billion this year alone, while Gates has gained US$9.5 billion in 2018. These two fortunes underscore a widening wealth gap in the U.S., where those with the most capital are accumulating riches the fastest. It’s also a worldwide trend. France’s Bernard Arnault has an US$86.2 billion fortune, equal to about 3 per cent of his country’s economy. The net worth of Spain’s Amancio Ortega represents 5 per cent of that nation’s gross domestic product. And then there’s Bidzina Ivanishvili, whose worth about a third of Georgia’s GDP. The Gates and Bezos mega-fortunes may not last long. Gates has donated more than US$35 billion to the Bill & Melinda Gates Foundation and said he intends to give away at least half of his wealth. Bezos, meanwhile, may be about to cede some of his fortune for a different reason: he and his wife Mackenzie are divorcing.